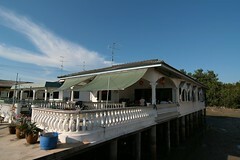 Kukup is a fishing village turn tourist spot in a town of Pontain Johor Malaysia. Although tourism had heavily influence the town, the colours of Kukup is still there for us to enjoy. And for those who like Chek Jawa in Ubin, stay in Kukup is like living on the Ubin Broadwalk with the views of Hermit Crabs and mud skipper just out of the window. 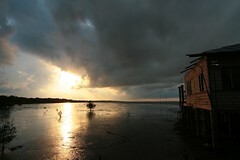 Sunset in this peaceful fishing village.